This week’s NERW is coming to you a little early, both because of breaking news and the Labor Day weekend holiday. 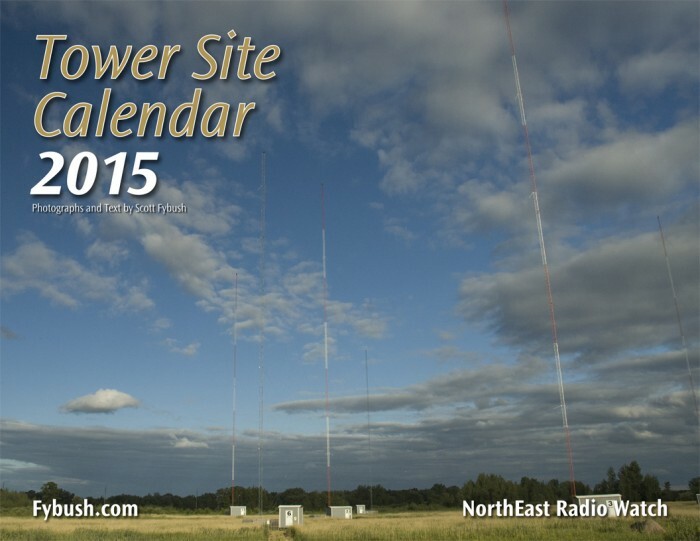 And it’s coming to you FREE for the weekend – in part to direct your attention to the pre-order period for the brand-new Tower Site Calendar 2015, and in part to help you spread the word about what we do here at NorthEast Radio Watch and fybush.com. Put bluntly, we need to substantially increase our subscriber base to be able to keep on bringing you all the news about radio and TV “first, fast and accurate,” as we’ve been doing for 20 years now. Nobody’s better at spreading the word than you, our loyal readers and subscribers. So if you appreciate the service we provide here, now’s the time to tell a friend or a colleague and to share this column, paywall-free, on social media or the message boards of your choice. Subscriptions cost as little as 29 cents a week, and they go a long way to making this service possible for a long time to come. Thanks for your support! With just 250 watts at 413 feet up the AM tower, the new “WFAS-FM” can’t come close to matching even the reach its class A predecessor enjoyed over most of the county. Its directional pattern is aimed mainly northward, with a 60 dBu contour that extends westward over the river to Nyack, north to Chappaqua and Pleasantville and east to a corner of Greenwich. The need to protect co-channel WWSK on Long Island means the new 94.3 WFAS signal won’t be of much use along Long Island Sound, where New Rochelle and Mamaroneck will hear “the Shark” instead. But a signal’s a signal, and in central Westchester, at least, Cumulus now gets the chance to try to rebuild some of the audience it surrendered two months ago. For now, the new 94.3 launches without local jocks, though John Tesh’s syndicated show will reportedly air in middays. Over the longer run, it’s less clear what Cumulus’ strategy in Westchester really looks like. After this year’s big changes on Secor Road, what’s left now is WFAS (1230 White Plains) with a mix of local and syndicated talk and the new “WFAS-FM” with its AC format in direct competition against Pamal’s much bigger WHUD (100.7 Peekskill) from northern Westchester. There’s a pretty substantial rebuilding process ahead for Cumulus: NERW hears rumblings that when the former FM staff departed, most of the automation system in the building was wiped out, leaving the skeleton AM staff scrambling to stay on the air. And even after getting everything back up and running, the gap between the end of 103.9 and the launch of 94.3 means WFAS has to rebuild its sales and marketing from scratch now. Will Westchester welcome it back with open arms? *Clear Channel is already reworking its plans to rearrange the FM dial in eastern New England. The big change filed last week affects RHODE ISLAND, where WWBB (101.5 Providence) will still downgrade from class B to class A – but instead of relocating to one tower of co-owned WHJJ (920) in East Providence, the new 101.5 would instead trade its current Rehoboth transmitter site for a new home right in downtown Providence, high atop the 28-story One Financial Plaza skyscraper. From that site, WWBB would become a 6 kW/298′ DA signal, still with a directional notch to the northeast to protect upgraded sister station WBWL (101.7 Lynn) in the Boston market. And while a drop from B to A is indeed a big deal, it’s still important to note two factors at play here: first, much of the present WWBB’s coverage area that will be lost falls to the north, outside the Providence Nielsen Audio market and thus outside the territory where Clear Channel can get ratings and revenue from that signal. And second, moving 101.5 from Rehoboth to downtown Providence will actually better center what’s left of the signal over the population core of the market; what’s lost is primarily in the very rural areas south and west of Providence. *Those moves are all designed to give Clear Channel better reach for the country “Bull” format that’s been drawing record high ratings in Boston on 101.7, something the company’s hoping to build on with a new hire. WBWL is poaching PD Lance Houston from sister station WPOC (93.1 Baltimore) to serve as both PD and afternoon jock. Once he’s on board in the next few weeks, expect a local midday jock to be announced as well. But that wasn’t the only Bull move in the region last week. Clear Channel made a Labor Day weekend flip on the NEW HAMPSHIRE seacoast, too: as of Friday afternoon, WSKX (95.3 York Center ME) is now “95.3 the Bull,” replacing the AC “Coast” format it had been carrying for several years. As in Boston, the seacoast “Bull” is aimed at a long-established, higher-powered, more localized competitor, Townsquare’s top-rated WOKQ (97.5 Dover). *With the departure of the longest-serving TV anchor in MASSACHUSETTS, WBZ-TV (Channel 4) is revamping its anchotr lineup: Jonathan Elias replaces Jack Williams on the 6 PM newscast, opening up a slot on the 11 that will be filled by current morning anchor David Wade. Wade will team with Lisa Hughes at both 5 and 11; Hughes had been co-anchoring the 6 with Williams, but former 5 PM co-anchor Paula Ebben swaps places with her there. Kathryn Hauser comes on board to replace Wade in the morning. Back on the radio, Entercom renewed one big show for a few more years. Not Howie Carr, whose impending contract expiration at WRKO (680) will be a big story in the next few months – but down the hall at WEEI-FM (93.7), John Dennis has reportedly joined morning co-host Gerry Callahan in signing a contract extension for their “D&C” morning show. On Martha’s Vineyard, the community group called “MVPBS” is fighting the FCC’s dismissal of its application for a low-power signal on 105.5. The Commission said MVPBS didn’t present evidence that it’s a qualified noncommercial entity, but it’s submitted a petition for reconsideration with additional documentation. MVPBS was one of two 105.5 applicants on the Vineyard; the other, one of the “M&M Community Development” groups that proposed multiple LPFMs in both recent windows, has its Oak Bluffs application still in “received” status limbo at the Commission. In Springfield, Spanish religious WLHZ-LP is on the move again. After initially being authorized on 104.9, the low-power station moved to 107.9, 98.7, back to 107.9 – and now it’s headed to 100.1 after demonstrating to the FCC that it will receive less incoming interference on that channel than it does on 107.9, where it’s affected by WXKS-FM from the Boston market and WEBE from southern Connecticut. *From CONNECTICUT comes word that “Miss Klonk” (Suzanne Moutinho to the DMV) has found new work after the demise of the rock format on WCCC-FM (106.9 Hartford), where she held down afternoon drive. Klonk was also the promotions director for ‘CCC, and she’s now assuming that same role across town at Connoisseur’s revamped WDRC-FM (102.9 Hartford) and its AM sister stations. *In MAINE, Light of Life Ministries has a new translator on the air in Brunswick, where W234CG (94.7) has filed for its license to cover, relaying WMEY (88.1 Bowdoinham). Just down the road, Jim Bleikamp’s WCME (900) has a new morning co-host. Bruce Stevens, the Boston radio veteran who’d been at the helm of the “Midcoast Morning Buzz” for the past year, has moved back to Connecticut to work with his wife’s educational consulting business, and his departure means frequent guest host Tom Pagnotti is now in the host chair every morning. In Bangor, two analog LPTV stations are making digital plans. MeTV affiliate WBGR-LP (Channel 33) has applied for a digital companion channel on RF 18, while former sister station WCKD-LP (Channel 30) applies to go digital on 11. And up north, the Harris MW5 at WFST (600 Caribou) burned up recently; the station tells the FCC that the transmitter can’t be repaired, and it’s running on a loaner transmitter at 1000 watts daytime instead of its usual 5000 until a new transmitter can be delivered sometime later in September. *In VERMONT, there’s late word of a format change at Steve Silberberg’s AM signals. WCAT (1390 Burlington), WRSA (1420 St. Albans) and WFAD (1490 Middlebury) are now carrying “Today’s Comedy,” the replacement for the defunct “Comedy 24/7” service. And Vermont Public Radio has been granted a new Burlington translator. W274BU (102.7) would run just 5 watts from the VPR studio in Colchester, relaying WVPS (107.9 Burlington) from Mount Mansfield. *On an otherwise quiet week in upstate NEW YORK, it’s the end of the road for an ill-starred noncommercial signal near Buffalo. WFWO (89.7 Medina) was licensed to Pastor John Young’s Fellowship World in 2012, but as NERW first reported in July 2013, the station never seemed to actually be on the air from its licensed location in rural Orleans County. Instead, we – and others – heard the 89.7 signal coming from Young’s church on Main Street in Buffalo, which led to an FCC notice of unauthorized operation. It also led to some questions when WFWO filed for license renewal, in the form of a pointed FCC inquiry seeking very specific details and invoices to prove that the station was really on the air in Medina. The station didn’t respond to that inquiry over the summer, and now the FCC has deleted the calls and cancelled the license. A sleepy translator in Binghamton is about to get some big changes. W240AJ (95.9 Endicott) has carried the programming of religious WMHR (102.9 Syracuse) for many years, but translator owner John Pike’s death put the signal up for sale. Now another religious broadcaster, Montrose Broadcasting from Pennsylvania, is paying Pike’s estate $10,000 for the translator, which will move to 95.5, boost power to 100 watts and become a relay of southern gospel WPEL (800 Montrose). The move will give WPEL two services in Binghamton, where W292DL (106.3) and W234BT (94.7) both carry the religious format of WPEL-FM (96.5 Montrose). *The march of national radio branding across CANADA arrived in Cornwall, Ontario last Monday, as both of Corus’ stations there relaunched with national brands attached to modified versions of their existing formats. First up was CFLG (104.5), which swapped out “Variety 104.5” for “104.5 Fresh FM” at 11 AM, followed four hours later by the relaunch of CJSS (101.9) from “Greatest Hits 101.9” to “Boom 101.9.” Tom Schoch is the new midday host at CJSS; Bill Halman moves from afternoons to host mornings with Dan Allaire and PD (“brand manager”) Darryl Adams takes over afternoons. Shannon Brooksbank moves from 101.9 to 104.5’s midday shift; otherwise, the lineup there remains stable. In Peterborough, Corus flipped “KRUZ 100.5” (CKRU) from classic hits to AC Friday morning, relaunching the station as “Hits 100.5” in a move similar to the one it made earlier this year at CKWS (104.3) over in Kingston. And in London, Rogers changed names at CHST (102.3) on Thursday, ditching “Bob” in favor of the “Jack” name it uses on its variety hits outlets in five other Canadian markets. More than half a million impressions from one calendar? How is that possible? 1. Magazines issues are designed to be looked at for a period of weeks or months. Calendars are designed to be looked at for a whole year. 2. Magazines are read or glanced at, then placed in a drawer or in a pile. Calendars are hung on a wall. Plus, people don’t usually walk into someone’s office, pick up a magazine and start to read it. But they do walk into someone’s office and see a calendar hanging there. Let’s do the math: four impressions or views a day (conservatively), five days in a work week (at minimum), 260 work days per year. That’s just over 1,000 impressions per year. We sell around 600 calendars each year. That’s 600,000 total impressions for the year! A 4-by-1-inch banner ad on each month’s page costs only $2,500. That’s less than one penny for each impression your ad makes on a broadcast-industry professional. The Tower Site Calendar has become THE prestige print product of the broadcast industry. Since 2002 it has become a must-have for engineers and engineering managers in stations big and small, all over North America. Give us your layout and we’ll give you the exposure. We’re ready to work with you! Call us at 585-442-5411 between 9 a.m. and 9 p.m. ET, or email lisa@fybush.com. *It was the out-of-left-field radio deal of the year: we”d known that the ever-growing Cumulus Media behemoth was coveting one of its main syndication rivals, Dial Global, but until late last week, it wasn”t clear how the debt-laden Cumulus planned to pay the $260 million price tag for Dial Global. Now we do – it”s generating the cash through a pair of deals that will send 68 of Cumulus” stations to one of its smaller competitors, Townsquare Media. And as with any of these big deals lately, there”s another piece: out west, the investment group behind Townsquare also has a big piece of Peak Broadcasting, which is sending its 11 stations in Boise and Fresno to Townsquare so that Townsquare can then swap them to Cumulus in exchange for 15 more Cumulus stations in Dubuque and – more to the point here – New York”s Hudson Valley. *Brooks Brown may have been from Texas originally, but he became an essential part of southern VERMONT in his three decades at the helm of WEQX (102.7 Manchester), the station he put on the air in 1984 as one of the last built-from-scratch class B FMs in the northeast. From its transmitter site high atop Mount Equinox and its studios in an old house in Manchester, WEQX never wavered from Brown’s original commitment to provide an independently-owned source of alternative rock for a region that stretched across southern Vermont down toward Albany. Along the way, WEQX became a training ground and jumping-off point for several generations of New England broadcasters; today there are former WEQX jocks and programmers working in the industry all across the country, from New England as far afield as Nevada. Like any independent broadcaster in possession of a big signal, Brown was aggressively courted over the years by bigger companies looking to pay big dollars for WEQX, and he took pride in recounting the often profane ways in which those offers were summarily dismissed. Sadly, Brown didn’t make it to the 30th anniversary of his station; we’re told he suffered a stroke in his sleep on Thursday night from which he didn’t recover, and he died later on Friday. He was just 66. *Equity Broadcasting pulled a pre-Labor Day frequency swap in southern NEW JERSEY, sliding classic hits “Sunny” WSNQ from 105.5 Cape May Court House down the dial to the former WAIV (102.3 Cape May), while WAIV’s simulcast of top-40 WAYV (95.1 Atlantic City) moves to 105.5. The move will make WSNQ a little louder at the state’s southern tip and across the ferry in Rehoboth Beach, Delaware. *It was a busy last week of August in eastern CANADA, where we now know for certain who’ll take the last of the Astral/Bell properties being spun off in that mega-deal. It’s Newfoundland-based Newcap that’s getting Astral’s CHBM (97.3 Boom) and Bell’s CFXJ (Flow 93.5) in Toronto along with three stations in Vancouver, and Newcap will pay C$112 million for the five stations in what will now be the company’s two biggest markets. *Vandals struck the tower sites of two AM radio stations around the country early Friday morning: KRKO (1380) in Everett, Washington, where the activist group Earth Liberation Front is taking credit for the bulldozer attack that took down two self-supporting towers at what’s been a very controversial new transmitter site – and WAEB (790) in Allentown, Pennsylvania, where the northernmost of five 1949-vintage guyed towers at the Whitehall, PA transmitter site was brought down by someone who snipped three sets of guy wires. WAEB, a Clear Channel-owned talk station, is licensed to run 3600 watts by day using just two of the towers, with all five towers in use at night with 1500 watts – and the station has remained on the air, evidently using either the day pattern or lower power, non-directionally. The tower that fell went down in one piece, which is unusual for a guyed tower, and its tip barely missed the guy wires for the next tower to the south, avoiding still more damage to the site. An investigation into the vandalism is now underway, with the FBI involved. There’s on-line speculation about connections between the WAEB attack and the KRKO attack just hours later; our semi-informed speculation would suggest that there’s no obvious link between the two incidents, since WAEB – unlike KRKO – is a longtime fixture that’s never caused much controversy in its neighborhood. *Back in the day, a format war in a place like Syracuse, NEW YORK meant a head-to-head battle between two standalone stations – say, WOLF and WNDR – each one throwing everything it had at the wall in hopes of taking the competion down. As of last Friday, there’s once again a format war brewing in Syracuse – but this time it’s a somewhat tamer fight, pitting two arms of a big corporate cluster against another signal recently spun off from that same cluster. At least there’s one thing the latest battle in the Salt City has in common with the wars of the last generation: it still involves a station called WOLF, broadcasting from the same little concrete-block building on Kirkpatrick Street that was the scene of so much good radio in the sixties and seventies. The dominant country station in Syracuse for more than a decade now has been Clear Channel’s WBBS (104.7 Fulton) – but when Clear Channel had to unload another signal in its cluster, the former WWDG (105.1 DeRuyter), it inadvertently unleashed a competitor to “B104.7.” As NERW readers know, the 105.1 signal went back to its former owners, Craig Fox and Sam Furco, doing business as Foxfur Communications. Foxfur initially took 105.1 back to its old calls, WVOA-FM, with the same religious/ethnic format it had used until 2001. But a couple of weeks ago, WVOA-FM flipped to a simulcast of Radio Disney (heard on Fox’s WOLF 1490 and two sister AM stations) – and then, last Thursday, 105.1 flipped again, this time to “WOLF Country,” going right up against B104.7 just two notches away on the dial. *Down the Thruway in the Albany market, the analog audio signal at 87.9 MHz that WRGB (Channel 6) had been running is now off the air. We’d been wondering about the authorization for that signal, which is even closer to the bottom of the FM broadcast spectrum than the old 87.75 MHz audio of WRGB’s old analog channel 6 – and it appears that there simply was no authorization from the FCC for the signal, which disappeared last Monday. *Speaking of radio wars, the sports battle in eastern MASSACHUSETTS continues to heat up – and there’s no hotter property this time of year than the rights to carry Boston Red Sox games. Entercom, of course, is in the midst of a big-ticket, ten-year deal to broadcast the team’s games, which have been running for the past two years on WRKO (680 Boston)…except when they’ve been on sister station WEEI (850 Boston) instead, generally on Wednesdays and on early-season day games and some weekend games. Until last week, that is – when Entercom abruptly shifted the entire Sox lineup over to WEEI from WRKO. Why make the move? Competition, obviously – with WEEI’s sports dominance suddenly under fire from CBS Radio’s new “Sports Hub” (WBZ-FM 98.5), it makes more sense for Entercom to put its biggest sports programming on WEEI itself than to try to use the Sox to draw new listeners to talker WRKO. Entercom pulled the games off “The Game” last Monday (Aug. 24), citing failure to pay the rights fees, something Absolute acknowledges – but Absolute says in light of the weak economy, it’s giving its advertising clients more time to pay the stations, and therefore it requested more time to pay Entercom. That dispute was resolved by the weekend, when Manchester and Nashua listeners could once again hear the Sox on WGAM/WGHM – but that may be the least of Entercom’s headaches, since it’s not clear, from what we’re hearing, that the sudden change of Sox flagship AM signals was permitted by the company’s contract with the team. *A familiar VERMONT morning team is coming back to the airwaves. “Corm and the Coach,” who started on WIZN (106.7 Vergennes) before settling in for a long run on WCPV (101.3 Essex NY) that ended last year, have signed up with a new entrant in the market, Convergence Entertainment’s WNMR (107.1 Dannemora NY). That signal from across the lake was pretty weak in Burlington the last time we heard it, during its stint as WELX, a leased-time simulcast of WCLX (102.9 Westport NY), but it has upgrade potential for Convergence, which is apparently starting out with a lease of the signal from owner Randy Michaels. After the morning show featuring Steve “Corm” Cormier and former UVM basketball coach Tom Brennan, the station will apparently be offering some flavor of FM talk to the Champlain Valley; the morning show will also eventually be simulcast on another new Convergence acquisition, WGMU-CA (Channel 39). *EMF’s “K-Love” contemporary Christian programming is about to get a much bigger footprint in western PENNSYLVANIA, as EMF prepares to buy WOGI (98.3 Duquesne) from Keymarket Communications, removing that signal from the four-way “Froggy” country simulcast that rings Pittsburgh. Keymarket will move the WOGI calls to another “Froggy” signal, the Moon Township-licensed WOGF (104.3) that overlaps most of WOGI’s Pittsburgh coverage – and there are some interesting ideas making the rounds about potential signal improvements for the class A 98.3 facility, particularly in light of EMF’s existing WKEL (98.5 Confluence) at the southeastern edge of the Pittsburgh market, not to mention the cross-ownership between Keymarket and Forever, which owns big-signal WFGY (98.1) over in Altoona. *The news from CANADA starts with more big changes on the TV dial: the “E!” network programming that had been on Hamilton’s CHCH-TV (Channel 11) and Montreal’s CJNT (Channel 62) is gone as of today, as Canwest Global shuts down the Canadian version of “E!” and spins off the Montreal and Hamilton stations to cable programmer Channel Zero. The Hamilton station is ramping up its local news commitment, including all-news blocks in late morning and, starting next week, early afternoon. It’s adding at least 12 news staffers, and will reportedly be opening a Toronto office as well. Its long-term survival is still in question, but CANADA’s most controversial radio station is at least assured of staying on the air beyond the middle of this week. CHOI (98.1 Quebec City) was due to have its license pulled this Tuesday (August 31) after the CRTC denied its application for renewal – but late last week a Canadian court told station owner Genex Communications that CHOI could remain on the air for now, as it challenges the license revocation in court. A bow to public opinion after CHOI brought some 50 buses full of supporters to Parliament Hill? Across the border in upstate NEW YORK, a familiar midday voice is back on the air after nearly a year’s absence. You’ll recall that Bob Lonsberry made quite the media splash when he was ousted from the 11-2 slot on WHAM (1180 Rochester) last September after making comments that many interpreted as a racial slur on the city’s mayor, who was then embroiled in a heated (and ultimately unsuccessful) race for Monroe County executive. The other big story came from the other end of the Empire State, where Arthur Schwartz left his longtime post as restaurant critic for WOR (710 New York), in what was apparently a dispute over how much influence advertisers would be permitted to have over the content of his daily restaurant talk show. Substitute hosts filled that 11-noon slot last week; its long-term future is unclear. In CONNECTICUT, WFSB-TV (Channel 3) will be moving out of the studio facility it’s called home ever since its debut in 1957. Station owner Meredith is selling the building at 3 Constitution Plaza to the city of Hartford in exchange for a new site on the underdeveloped north side of I-84, along Main and Trumbull streets, where it will build a new studio that it plans to occupy in early 2007.